Are you extremely tired searching google for French accents to copy and paste into your document? Sometimes, you just want to type a quick message and neglect accents because it’s bothersome to remember ALT codes. No fancy French keyboard required and no settings to switch. This stuff is built into your Macbook. How else could I write articles here or type French papers with such ease? 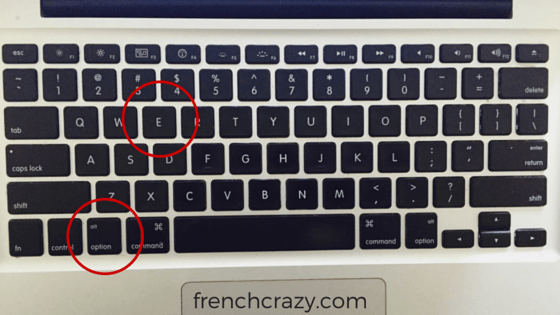 There are two steps required to type French accents on your mac device. First, you must hold down the option key and then click on a certain letter. The letter depends on the desired accent (you’ll see the combinations in the next section). THEN, you release the two keys you were just holding down. The accent should appear on the screen although it will be hovering over nothing… you need to assign a letter to the accent! Now type in the letter you want the accent to receive. It’s that simple! Option key + letter c. No additional letter needs to follow. Option key + letter e at the same time. Release all the keys you held down. Now click the e again. Option key + ` (found in the top left of your keyboard, on the key with the tilde). Followed by a, e, or u. Option key + letter i. Followed by a, e, i, o, or u. Option key + letter u. Followed by e, i, or u. Option key + letter q. While holding the option key, click “e” once (just as if you were typing the letter “e”). Release both the option key and e. Now say I wanted this accent I just produced to go above an “i.” I would type in an “i” in the same manner I normally would, except this time the letter would receive the desired accent. Pro tip: In order to make any of the accented letters capitalized, all you have to do is hold down the shift key when typing in the letter you want to assign the accent to. At first glance, this all may be a little to much to take in now, don’t worry! Keep referencing back here if you forget which keys to use and you’ll be naturally typing accents even FASTER than when using a French keyboard. These are all the skills I used to make typing French accents on mac computers. Thanks for the great guidance. This has made things a lot easier for me. Just a comment on the comment above. When I click on e and wait, I just get more es and no little box with accents. I’ll create a little cheat sheet and will be off to the races. What once scared me, is now so much easier and like you, it’s become second nature. Thank you ever so much !!!!!!! This doesn’t work on my Mac Air for accent grave (and maybe other accents. option + ` gives me the scandinavian å which can’t be edited. Are you sure you’re not trying to do this in one step? It’s two distinct steps. When you do option + a you’ll get å. Believe me, it works as described above. How do I type the French quotation marks in Word that includes an automatic non-breaking space? Typing option + \ would produce « but I still need to enter option + space to get that non-breaking space after it. This doesn’t work on my keyboard for either circumflex or trema. Also for accent I only need to press option + e, without need to press e again as instructed! This works for a small e but not for a capital E. You are not spelling out the difference in your blog and it doesn’t work!!! You’ll still need the ALT codes to do œ, Œ, « and » though. Thanks for this guide. It’s the best one for the Mac that I have found. Very detailed! I’m so glad I don’t have to cut and paste the letters from other docs anymore to get the accents. NO it does not work. I wish to use circumflex a. When I use Option-i, I get the accent. When I release and type a, it types an a in a new space. The circumflex hangs in the air! I’ve tried the same sequence in both Word and Pages and in both I achieved the correct â. Click and hold ALT and I together, then release and the ^ appears. Then type an A immediately: â.
I’m using mac and I’m trying to get word, how do you get it? If you are using mac depending on what you are doing you can just hold the letter that you want an accent on down and select the one you want. Also on some other computers you can change the keyboard to french (computers like chromebooks). Hi, how do you indicate the arrondissement in an address when typing on a mac keyboard; am I interpreting it correctly that it’s a tiny superscript “e”? Superscripts are usually not active, but if you open up Pages or Microsoft word then you can create a superscript by doing COMMAND, CONTROL and the PLUS KEY at the same time. You can also go to the settings of your word processor and there should be an option to insert a superscript/subscript. I usually just do the latter. How do you type 0ͦ (zero no letter o) for degree on a US keyboard? John, you are a God-send !! Plus having won a whole host of brownie-points!!!! You cannot know the number or times I have asked the same question about typing French on a “qwerty” keyboard” and invariably getting the same answer: use the French “Azerty” keyboard which is a nightmare when you touch-type and use both French and English all the time. Hallelujah! Finally a website that explain this whole process logically and helpfully! I might actually be able to write things in a more accurate fashion. Thank you ever so much! Might I post a link to Facebook? It’s working for me, I had to give it a few tries depending which letter I want, but in the end, it works and I’m very happy. Now to memorize these by heart! I can use the shortcut for é etc correctly but cannot get à on a shortcut. I am using a smaller keyboard, hence there is no ‘ on the top left as you describe. Perhaps that is why. The à is one I use regularly so would really like to know a shortcut. Thank you. Me too and our enthusiastic Mac user doesn’t seem to have an answer for us. If I use the key marked ‘ underneath the ” symbol which is also on it, I get æe which is definitely not an e with a grave accent. I have found the grave key on my keyboard. It is between the left-shift and Z just left from the alt key. I am just transferring from PC to Mac and the process is a combination in PC too, (Alt+0232) so marginally less elegant than Mac-world. Thank you, thank you, thank you! I have been searching for this key on my MacBook Air and never thought to look on the bottom left instead of the top left! This information is super, thank you! How do we make the capital E with l’accent aigu? Do the option + e command for the aigu mark then make your “E” capitalized (like normal) by holding down the shift key when you type it. Tried that. Doesn’t work. The accent appears before the letter instead of on it. I have been trying to get this right for so long. Even Apple’s own instructions don’t make it clear that it’s a two-stage process, not helped by the fact that they insist on calling the ALT key ‘Options’. No problem! I love using a Mac because it’s so easy to type accents. I struggle a bit more on my window’s desktop. Really? I used this just now (and for the past few years) because running a site about French requires typing accents all day! Make sure you hold down the option key and then click one letter referring to the accent you want. Release all those keys and click the letter you want the accent to go above. I may make a video to better clarify this concept. Your article is quite helpful to me. I have bought a laptop as well as french keyboard. I really like to write french language but i didn’t knew that how to type. Now i have got some tactic tips from you. Thanks for sharing your experience with us.